This high quality rustic accent chair from Worldwide Homefurnishings Inc. surrounds you in quality comfort and style, perfect for lounging after a long day. A perfect combination of style and stability, this accent chair comes designed with a unique animal print pattern. Combining classic good looks with supportive comfort, the Verona accent chair will be right at home in your den, living room or family room. The rich neutral brown coloring, high-density foam seating area, and elegantly curved arms blend seamlessly with existing dicor. The bentwood and rubber wood construction ensure stability and thanks to its webbing seat structure, this chair provides a strong and flexible seating solution that will stand up to regular use with ease. Create a relaxing reading or TV-viewing space anywhere in your phone with this ultra-comfortable accent chair. Angus Rustic Wingback Faux Leather Accent Chair in Black with Animal Print Pattern This high quality rustic accent chair from Worldwide Homefurnishings Inc. surrounds you in quality comfort and style, perfect for lounging after a long day. 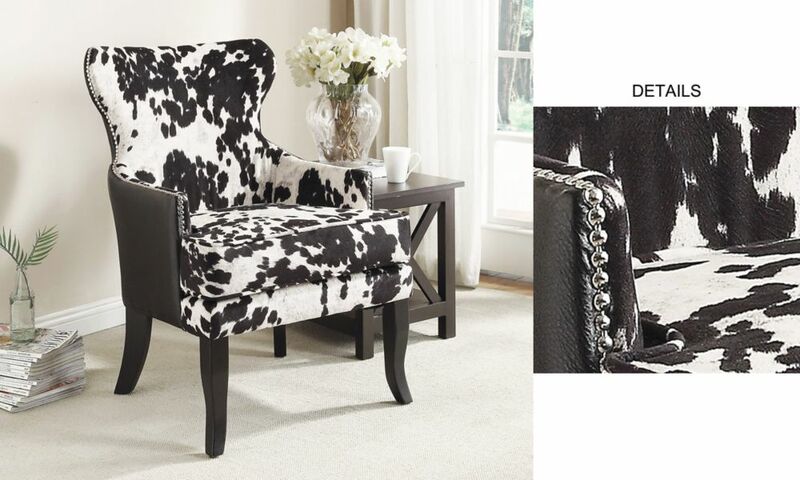 A perfect combination of style and stability, this accent chair comes designed with a unique animal print pattern.